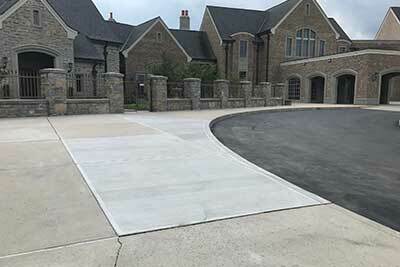 When you need your home's concrete driveway constructed, or need a concrete slab created for your next residential project, Houck Asphalt Maintenance can assist in any concrete job. Whether it's for sidewalks, patio’s, or a concrete floor stained, allow us to do the work for you. We can re-patch, smooth out, or even reconstruct an existing concrete driveway slab, and we have the capabilities, the personnel, and the experience to do the job right the first time. That's because with years of experience, we know that as a concrete contractor, our specialization in concrete work such as masonry projects for residential and commercial buildings in demand. Generally speaking, we'll deliver quality work according to the client's specifications line-by-line. Our experience cement masonry experts can work on creating beautiful craftsmanship when it comes to specific projects. Our concrete finishers can work on roads, streets, floors, sidewalks, curbs, as well as pours, smoothing, and finishing surfaces for various properties and buildings. We, as a concrete contractor, have experience in working with colored cement for that special look you may be going for. Again, there's no job too large or small at Houck Asphalt Maintenance. You can bet that we'll finish the concrete project that never got completed by another contractor. Plus, as a concrete contractor, we'll do it in a quick and quality-driven manner for an affordable price that will not break your bank or concrete budget. By doing concrete flatwork for our customers, we illustrate a strong workmanship and desire for the concrete contractor services we offer. We have a strong commitment to keeping our relationships as a professional concrete contractor within the community of Bethel and the surrounding area. Assembling a concrete contractor crew with the most qualifications will only deliver our customers the quality work, which is what we do best. Being a top concrete contractor we always have safety, quality, and our customers needs and wants on our minds. As a concrete contractor, we deliver many years of quality concrete work with years of experience. With Houck Asphalt Maintenance, we have the time and the qualifications in all angles of concrete projects. We’ve also streamlined our work because of our experience. This includes the affordable materials and labor provided by our concrete contractor crew, which we have on board. With some of the most competitive prices in the area including the region, Houck Asphalt Maintenance, has manageable and professional time limits. Plus, we never attempt to interfere with you or your business day and home lifestyle. Some other notable elements to us being a quality concrete contractor are patching up voids, utilizing power tools, or cutting expansion joints. We have the ability to align forms for curbs and gutters. As a concrete contractor, with the years of Houck Asphalt Maintenance experience, and professionalism, we can consult with you or your project manager, estimator, and even your clients to expedite a concrete job. We're also bonded and insured and able to complete a job by a given date or time. Houck Asphalt Maintenance has many returning customers because of our loyalty to the projects we've completed in the past. With our company's concrete finishers, completing your driveway, sidewalk, patio, or any other concrete job, your project will be the best looking concrete job done in your area. We also can work in decorative type concrete projects. 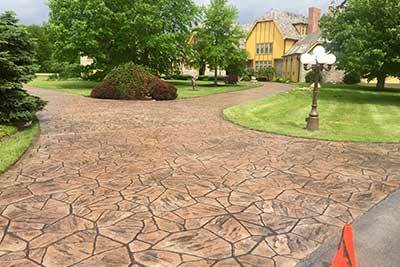 With this, it includes, staining, polishing, stamping, or creating decorative type concrete slabs and projects. Plus, if you have an upcoming bid that you may need help with to complete the job, add us to your subcontractor's list as a concrete contractor, we stay on top of all projects. Houck Asphalt Maintenance will make you proud that you hired us as your concrete contractor. We're quick, friendly and quality-driven. We can mix, pour, stain, and smooth out your next driveway with colored concrete or your next stamped concrete job if required in your specifications for your next project. Let us help you with your next concrete job or project. We'll give free estimates for any concrete project or concrete contractor work of various scopes and sizes. Call us today, so we can smooth your concrete work today. Our job performance and craftsmanship are reputable and quality driven. We have the appropriate equipment, tools, and crews to work on your next concrete project. Call us so we can provide you with an estimate or free consultation. 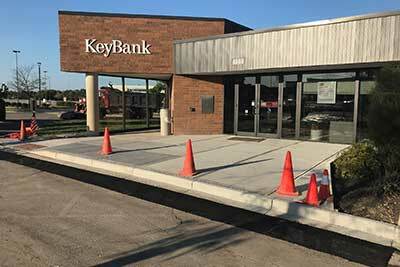 You can rely on us, one of few concrete contractors in the area, Houck Asphalt Maintenance (513) 734-4500 located in Bethel, Ohio and the surrounding area. We're here to meet all your concrete needs, so call today!